GET INVOLVED BY JOINING OUR VOLUNTEER TEAM! Sydney Festival would not be possible without our army of dedicated and generous volunteers. In 2018, we had an amazing team of 335 volunteers, and were blown away by their enthusiasm and generosity. 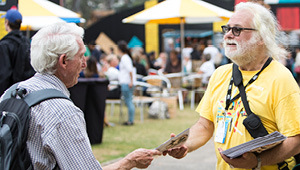 Volunteering is a great way to experience Sydney Festival and be part of Australia's largest annual arts event, as well as part of the team that makes it all happen. Applications to join the 2019 volunteer team will open in October, so watch this space!